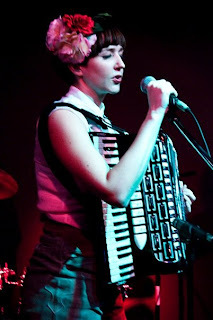 MISS NATASHA ENQUIST: ELECTRO-ACCORDION CHANTEUSE: Because I have soul! I was tagged in these photographs today on Facebook. They're from the brief performance I did with my friend Alfons - on trumpet, at the Cambie, briefly opening for Growler. I will be performing again for the Great Giffaldy Magician this Saturday afternoon. Looking forward to it, had a lovely time last Sunday. I'm planning on posting a proper listing soon of all my performance dates, public and private. I realise a weeks notice isn't enough for some of you! My Mother can back me up on this...Garfield was my favourite cartoon as a child. I had MANY Garfield books, and loved watching him on the Saturday morning cartoons on TV. My sweet friend Amanda sent this cartoon strip along to me, I love it! THIS SATURDAY APRIL 4th, 2009!